One thing that I just can't seem to shake is my reluctance to write 'rants' lately. I don't really know why. There's all sorts of stuff bottled up in the addled little brain of mine, and I have no idea where this idea that 'rants' have to be organized, orderly affairs with either an informational or educational purpose. Most people may not realize this, but Seraphim was not an anime fan when I met her. In fact, if it wasn't for me I doubt she would have been exposed to it much. I remember the first time I tried to explain to her what 'magical girl' anime was, and the look she gave me. I remember when she helped me move and was able to see my VHS fansub collection fill box after box and crate after crate -- and the look she gave me then. I'm still amazed that she didn't run far far away after these experiences. Anyways, our relationship aside, the fact is Seraphim and I never really used to watch a lot of Anime. I tended to watch stuff on my own here and there and on the computer, but the TV in the main living areas saw remarkably little anime. Ever since I started doing MT full time and Seraphim started coming to anime cons with me, we've been watching more. I can even say with pride that she's become hooked on a few series. Heheh. ph33l the evil influence. This all started, if you remember, when I threw out most of my old fansub collection to make some room on the shelves (well, to free up entire bookcases, to be exact), with the idea that I'd replace the majority of it with DVDs and over time. So, we started to pick up some DVDs and we've been enjoying some of them together. The only bad part, for me, is that Seraphim prefers (brrrrr) ... the English dubs. Now, I fully understand that a portion of my anti-dub stance (like many obsessive anime fans) comes from, well, being obsessed with the medium, and having acclimated ourselves to reading and watching shows in Japanese. Having done this, we get all the right emotive cues from the Japanese voice tracks and enjoy what we are watching without problems. Part of my aversion to dubs also comes from the fact that years ago dubs tended to be... REALLY bad. So it was with a kind of abject horror (and loosing the argument ^^;;) that we have been watching the stuff dubbed. It's actually been an interesting way to experience some of my favorite shows. Some of the dubs have actually been amazingly good. For instance, they did a fantastic job on Fruits Basket, and even the Trigun dub was pretty good. It felt almost sacrilegious to watch Haibane Renmei dubbed, but... even that was pretty good. Probably the most amusing dub we saw was for Mao-chan. Mao-chan is cute, kinda pointless, and very odd, but when the gal who does the English dub for Misora says 'I must protect the peace of Japan, I say, with high spirits!' ... I don't know why, but it cracked me up, and its become somewhat of a standing joke around here. Like I've said a half dozen times, my Japanese is not very good. If you were wondering where the Japanese I do use in the comics comes from, its usually Asmoedus (who is Japanese himself :) who helps me out. Even so, I still prefer the original Japanese tracks. Part of this is elitism, I agree, but a part of it isn't. If it were pure elitism, I would refuse to watch the English dubs. It's much better to be open minded to them and see just how far English dub actors and actresses have come over the years. But there is something interesting about the disconnect you get from listening to something in a foreign language. I've talked about this before (I should dig up the rant but I can't find it... yes, the MT site will be getting a search function sometime next year :), but sometimes just tuning into the emotive content of speech without actually knowing what is being said can be enjoyable and moving, if you open yourself up to it. Of course, if I were to put one of these on in the car while we were driving somewhere, I'm sure I'd get the same look I used to get when I first tried to explain the nuances of magical girl transformation sequences. :P Some things work best with headphones. There have been a lot of really good anime shows lately. 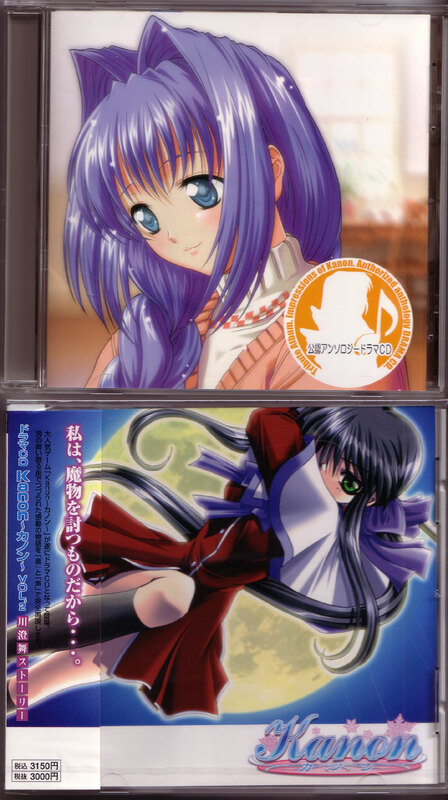 Of particular note is Shingetsutan Tsukihime (True Chronicle of the Moon Princess). This anime is based on a highly successful doujinshi (fan-made) game by a group called Type-Moon (that's the commercial group they are now, this link is for the doujin group site.). In much the same way the Hoshi no Koe ('Voices from a Distant Star") guy made me feel totally pathetic by animating this masterpiece all by himself, I feel absolutely inadequate next to the Type-Moon guys. I aspire towards making a deep, complex and emotive game and complex stories, these guys did it successfully, and garnered such a following that its now an animated series. Bleah, I say! Enough rambling for this rant. I think I'll just meander along like this for a while. Hope you guys don’t mind, I'm just in a mood to talk about little things. Oh, and next time, I'll talk a bit about Clannad. Word is that the game will finally be released early 2004. Yay!